It is not an unusual sight in parts of Italy to see a couple of resplendent ceremonial carabinieri stood at the main door of the opera house for an opera première. The opening night of Halévy’s La Juive at Opera Vlaanderen in Gent on April 15 saw a guard of Belgian police, some with sub machine guns. After last year’s shootings at the Jewish Museum in Brussels, the management were clearly taking no chances that someone might take the opera’s title as a provocation. La Juive was one of the grandest of the Paris grand operas with one newspaper commenting on the enormous Act 1 procession that “The Opéra may become a power capable of throwing its armies into the balance of power in Europe” [i]. The libretto by Scribe was typical of his style with an unlikely series of events and coincidences vaguely based on historical incidents, in this case in 15th century Constance, and culminating in a sensational ending. It seems that Meyerbeer might have been approached initially to write the music [ii] but it soon devolved on Halévy and the opera premiered on February 23, 1835. Ruth Jordan claimed that the story fired Halévy’s imagination because it brought him “face to face with his [Jewish] heritage” [iii]. However, he did not respond by making use of Jewish music to any great extent nor could much of the music be called particularly inspired; “as for popular music, it has none” was Donizetti’s opinion after seeing it [iv]. However, other composers, including Mahler and Offenbach and, more surprisingly, Wagner, have been more complimentary and, after a shaky start, the opera firmly established itself in the 19th century repertoire. 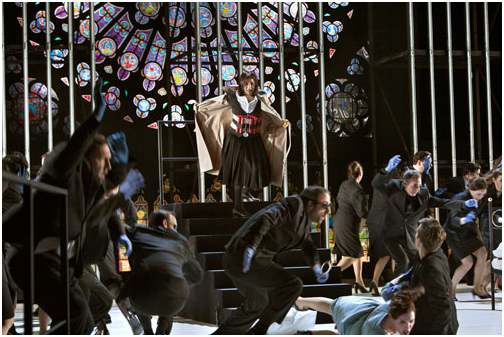 The opera is a rare beast today and I was particularly interested that Opera Vlaanderen had hired Peter Konwitschny as the director, who is known for his radical interpretations, such as that of La Traviata at ENO in 2013. To complement the opera, Opera Vlaanderen had also organised a two day conference on Judaism in Opera, during which Konwitschny discussed some of his decisions. He explained that he had directed little in the way of French opera, other than Carmen, and had been completely unfamiliar with La Juive until being invited to direct it. He talked of his Brechtian approach, no doubt a legacy of his East German upbringing, that aimed to avoid superficial sentimental emotion (“it’s not just about two poor Jews”) in the pursuit of a longer lasting and more deeply considered response ( “the audience should come out resisting intolerance”). More personally, he had asked himself whether he, as a German, was allowed to criticise a Jew – no doubt having in mind Eléazar’s own intolerance and morally ambiguous behaviour, particularly his lack of honesty with Rachel about her parentage. He then stated that he considered that the opera was too long with too many blocks to the dramatic flow and that the music was not good and had too many choruses. He had thus set about refashioning the opera to provide an exciting and suspenseful evening rather than just a long evening and certainly succeeded in his aim with an absolutely cracking performance that illuminated the spirit if not always kept to the letter of the opera. 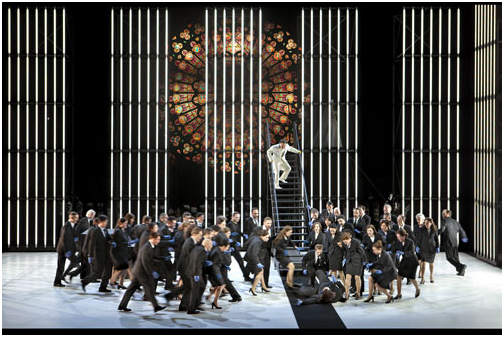 While this stance is anathema to some opera lovers, it was clear that Konwitschny had given the project considerable thought and was not just wanting to be different or to shock, the motivation that many often ascribe to non-traditional productions. Konwitschny saw the opera not primarily as Christian and Jew but as persecuting majority and persecuted minority, an essay in intolerance. To this end all wore modern dress with no distinction except that the Christians wore blue gloves and the Jews yellow. Thus he claimed to have deracinated the opera, although I doubt whether many would be convinced about this even if they might agree about his broader message. I wondered whether it was deliberate that he chose yellow for the Jewish gloves bearing in mind the yellow badge that Jews were forced to wear in Nazi Germany but which would have cut across his avowed neutral approach or whether it was an oversight. The set had a huge rose window and other stained glass at the rear, which were lit up for certain scenes and otherwise the main features were groups of vertical metal bars that were arranged in various structures according to the scene. Thus it was a fairly minimal, functional set with no indication of time or place. Typical of his reworking of the opera was his removal of the overture so that we plunged straight into the organ introduction to the “Te Deum” and the gathering of the Christians under the leadership of Cardinal de Brogni. Around a further 30 minutes was cut from the earlier part of Act 1 and its lengthy scene-setting. In Act 2, he moved Eléazar’s cavatine to the end of the act because it does not have any specific bearing on the action at that point but is of a more philosophic nature and he wanted to keep up the dramatic impetus with Eudoxie’s entrance immediately following Rachel’s rising suspicion about Léopold when he does not eat the unleavened bread. Act 3 caused the greatest discussion amongst the next day’s conference attendees because when Rachel publicly accused Léopold of being her lover she was shown wearing a suicide belt. Some delegates felt that this ran against Rachel’s role as a mediator and the whole thrust of her personality. Unfortunately, the chairman called time on Konwitschny before he could adequately explain his ideas behind it but he said that he did not consider her as nice a person as some did and seemed to have been thinking in terms of her wanting to destroy the patrimony that was suppressing the world. The end of the act saw the chorus, wearing various coloured gloves, constructing an endless series of suicide belts, presumably intimating that we are all complicit in prejudice and its manifest evils. Act 4, in which Rachel and Eudoxie come together in order to save the man who has betrayed them both, had their duet morph into a dance as they celebrated coming together to rise above the hatred that had hitherto permeated the opera and in washing their hands together both divested their gloves. One of Konwitschny’s techniques was to have singers come out into the auditorium and mingle with the audience while singing, often having them seem to make asides to the audience or to look to the audience for support such as when Rachel, in the auditorium, lambasted Leopold, on the stage, for his duplicity. It gave the exchange a feeling of overhearing someone else’s argument and a much greater involvement than with a traditional stage confrontation. While this sort of manoeuvre is not new, I have never seen it put to such telling effect, although I did sympathise with the woman who sat with her hands over her ears as the volume must have been pretty daunting when Eléazar sang the big hit number “Rachel, quand du Seigneur” a couple of feet away from her. The end is a problem. Scribe, as was his usual practice, aimed for an arresting stage coup with no regard for its musical potential [v]. Here the opera called for Eléazar and Rachel to be flung into cauldrons of boiling oil with Eléazar revealing that Rachel was Cardinal de Brogni’s daughter as this happened. Donizetti wrote on seeing it, “Too much reality – the final scene too horrifying, the more horrifying because of so much illusion” [vi]. For today’s director perhaps there can be no appropriate realisation living as we do under the shadow of the Holocaust. Here, Konwitschny had them walk up some stairs and then out of sight, while de Brogni fell down the stairs in his surprise and anguish. It served but lacked any real emotional punch. All the roles were strongly delineated, even Eudoxie who can be a somewhat shadowy figure, and all were acted with great energy and commitment. 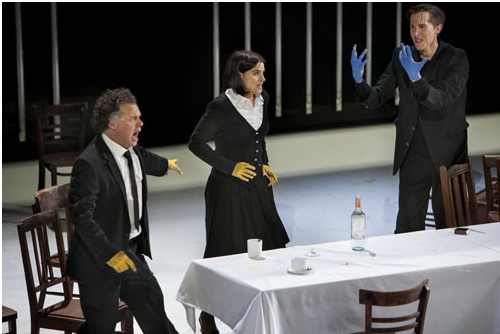 The singing (Eléazar – Roberto Sacca, Rachel – Asmik Grigorian, de Brogni – Dmitry Ulyanov, Léopold – Randall Bills, Eudoxie – Nicole Chevalier, Ruggiero – Toby Girling) was excellent particularly when one considers the very physical acting that they were often asked to do at the same time and the whole enterprise was well supported by the orchestra under Tomás Netopil. While some opera fans will no doubt decry such manipulation of the opera, it was all in all an intense and exhilarating evening and the audience clearly appreciated it. Unfortunately, on leaving the theatre past the armed police, they needed no reminding that intolerance is still very much with us. [i] Quoted in Hugh Macdonald, “La Juive”, The New Grove Dictionary of Opera. Vol 2, edited by Stanley Sadie (London: Macmillan Reference Ltd., 1998) , p.926. [ii] Mark Everist, Giacomo Meyerbeer and Music Drama in Nineteenth-Century Paris. (Aldershot, UK: Ashgate Publishing, 2005), p.221. [iii] Ruth Jordan, Fromental Halevy. (London: Kahn & Averill, 1997), p.59. [iv] Quote from a letter to Innocenzo Giampieri in Herbert Weinstock, Donizetti. (London: Lowe & Brydone, 1964), p.108. [v] “The denouement for which music can do nothing” wrote Donizetti of Scribe’s ending for Dom Sébastien – Zaida and Sébastien fall from the rope they are climbing down to escape – quoted in William Ashbrook, Donizetti and his operas (Cambridge: Cambridge University Press, 1982), p.187. [vi] Herbert Weinstock Loc. Cit.